So we got a fabulous offer from the M Resort. Two nights free stay, a $50 comp and $15 to gamble. We are always looking for an excuse to go to Vegas.. so why not. This hotel at the VERY southern end of Las Vegas Boulevard and St.Rose rises out of the desert like a black oasis. It has only been open for a year. Opened by Anthony Marnell Jr. from the same family who worked on the RIO back in the 1990’s. The hotel and casino are very nicely appointed and comparable to Stations – Red Rock Casino on West Charleston but with it’s own personality. The last season of Top Chef was also filmed here. Room. Check in was quick, friendly and efficient. 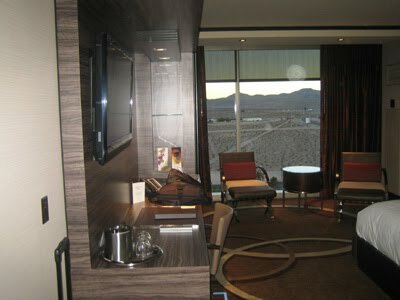 We requested and received a king room with a mountain view on the 15th floor. While it is not Red Rock there is something peaceful about looking out upon the desert with the mountains in the background. The other option is a view almost straight down Las Vegas Boulevard to see the strip and beyond. The bathrooms include a window with an electronic shade so you can see in our out of the bathtub through your room to your view of the mountains or the strip. Fully stocked mini bar, electronic shades, huge bathroom and plenty of room for your clothes. Casino. Plenty of slots, video poker, blackjack and other table games to keep you busy. Join the Imagine Rewards Club to get great offers including free nights, bottles of wine and other comps. Free soda machines on the floor and I have never had an issue getting a drink while playing. Food. Studio B Buffet has been lauded as one of the best buffet options in Las Vegas for the money. So much so that there is usually a long line when they first open. We have visited the buffet a few times and agree that the value is great for the money. Plenty of options including select beer, wine and even espresso or gelato to end your meal. Red Cup Cafe is the diner that is great for a quick breakfast and a great cup of coffee. The service was excellent and the food was great. There are other restaurants including Marinelli’s, a steakhouse and a sushi bar which I have not visited. Drink. Went to the Hostile Grape wine cellar which has several different wines for you to try. Purchase a pre-loaded card and try a few. You can also order cheese or other accompaniments while chilling out on one of the sofa’s. They also offer a full bar service. We had great service here, but the service was lacking at the 24/7 bar on the casino’s main floor. There were plenty of empty tables and great music playing but you couldn’t tell if the cocktail waitresses were working the bar or the casino floor. We sat there for 15 minutes and no one assisted us, so we left. We have stayed here twice and this was my only issue I have came across. Valet was great. You can call down ahead of time and they will have the car waiting for you. We did not visit the pool as it was January, but it looks like you can reserve cabana’s or have an entire area to yourself (for a price!). Overall the M Resort is a great place to stay and play especially if you don’t mind renting a car and getting away from the strip. It is located conveniently next to I-15 or a straight shot down to the strip on LVB. 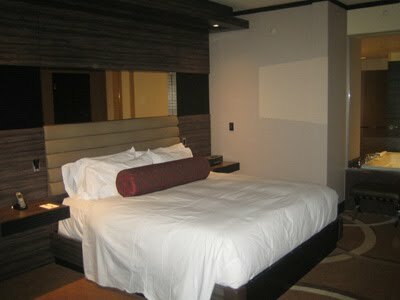 Great rooms, casino, food, players club rewards and service. So if you are a local or a regular visitor to Vegas it is a great place to have some space and get away from all of the tourists on the strip.